"You have grown older, and we less forgiving"
Pondering how far we should try to hike, we drifted toward sleep in the van at Bridge Camp trailhead campground Saturday night. Many considerations argued for a short first day. This would be my first backpack since my total hip replacement eighteen months earlier. Barbara had not completely recovered from an injury to her right foot at Jazzercize that felt like a plantar fasciitis. The weather was unseasonably hot for the beginning of June. As darkness fell, obscuring the river bank, the thunder and rage of Stuarts Fork of the Trinity River seemed to rise. "Do you hear someone yelling?" I asked, lifting my head from the pillow. Barbara listened for a while. "It's just the river." Voices in the river. Voices in the tumult seemed to howl an indecipherable dreamtime warning. You have grown older, they may have been shouting, and we less forgiving. The morning sunshine quieted the river, promising a fine day. The forecast held no rain. Still undecided, we started out early, hiking along the road above Stuarts Fork, going slowly in deference to our real and threatened infirmities. 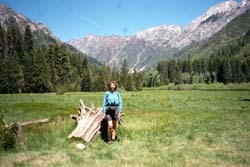 At Sunday Creek, just inside the wilderness boundary, I hopped across on boulders and Barbara took off her boots and waded through the calf-high current. We hiked through long flats in deep forest shade, climbed brushy slopes that wound well inland from the river, then returned to boulder-hop across Little Deep Creek. Deep Creek, with its thunderous waterfall, we crossed on a foot bridge. After trudging for a couple of hours, I began to feel the tines of a familiar pain in my right thigh, so we stopped for lunch and studied the map. At five miles from Bridge Camp, the Alpine Lake crossing seemed a bit too far for the first day. A nearer site designated "Oak Flat" on the map would put us about half-way to Morris Meadow and seemed a reasonable goal, barring a physical problem. When we resumed our hike after lunch, my thigh had loosened up. Shortly the trail dropped down along the river at a house-sized granite boulder where a use trail cut back to a campsite in a glade of shady maples beside the water. Barbara liked the campsite fine, but I thought it might be damp and buggy and wanted to press on just a little further to Oak Flat. We pressed on, but could not find Oak Flat. Instead, the trail climbed up and away from the river as we toiled upslope in the bake oven of the afternoon, rising and falling completely out of earshot of the river. No campsites presented themselves until at long last we arrived at the Alpine Lake crossing. Following the spur trail down to the river, we headed upstream to a good campsite we remembered and found it uninhabited. Only deer awaited us there on the gravel bar beneath tall firs, cottonwoods, and arching big-leaf maples. Like portentous vultures, the deer circled at a distance while we set up our tent. Late afternoon was still hot, but by perching on massive granite boulders in the middle of the churning river, we found a cool spot where the breeze blew downriver from the unseen snowfield far above. We indulged in evening cocktails, and I grew exhilarated by the sturdiness of my new bionic hip. Dancing from boulder to boulder, I chortled over the river's roar, "I feel like I'm twenty again!" We arose on Monday, and it was my birthday. I had already opened a rain jacket and pants and was having fun with the new GPS receiver. 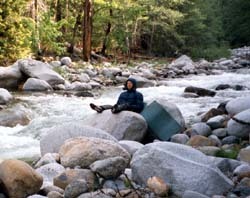 We enjoyed a leisurely morning meditating on the surging whitewater cascades and green river pools being forged endlessly on the steadfast anvil of granite boulders. Just as we were breaking camp, a group of young men, not much more than boys, arrived with the intention of fording the swirling Stuarts Fork to the Alpine Lake Trail on the other side. We warned them that the water was too high, but their wash of youthful invincibility was even higher, and they said they liked the challenge. Quickly we headed up the trail to avoid witnessing the carnage. As we hiked on to Morris Meadow, a group of three middle-aged men burdened only with daypacks hurried past us. Plodding on, we soon overtook them as they paused for snacks in the shade. Trinity Outfitters was bringing in their gear on horses, they told us. For the next hour we hiked in tandem, repeatedly passing one another like rabbit and turtle. Barbara's foot was beginning to give her serious pain, so we needed to get somewhere and take off our packs. Doggedly we pressed onward. On a steel-truss bridge the trail crossed Deer Creek's tumbling falls and headed inland, following the creek's north bank for a while before climbing over a divide and returning to the river in a series of dry boulder-strewn moraines and open forest below Morris Meadows. The daypackers arrived at the meadow just before we did and found their outfitter waiting, amount, with two loaded pack horses. 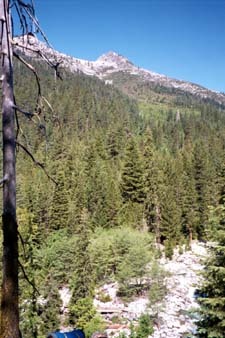 They chose the southernmost site with an unhindered view north across the length of the open meadow to the ragged granitic spires of Sawtooth Ridge beyond. No one else appeared to be camped at the meadows. We unloaded our packs at a nearby campsite. After exploring a couple of fine campsites at the south end, we decided to give our new acquaintances space. 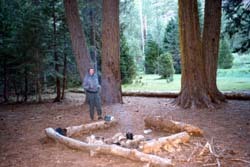 We picked our way along a relatively dry route through the wet meadow to "Morris Camp," the horse camp on the meadow, shadowed by a thick grove of incense cedars, interspersed with pines, firs, dogwood, and maples. Just as I had wished for on my 60th birthday, the campsite was vacant. A small seasonal stream meandered through for our water. We decided to spend two nights there and let our bodies mend. The deer were pests from the beginning, following us around to eat the salty soil where we peed and sneaking through our camp when our backs were turned. It seemed like a whole herd of them. We tried to deer-proof our gear by hanging everything from nails and broken branch stubs on the trees, but we were not entirely successful. The next morning we awoke to find that the deer had eaten my straw hat and slobbered all over our walking stick straps. Barbara's foot felt better, but I had developed a pain in my right Achilles tendon. We resolved to take it easy and day-hiked leisurely around and through Morris Meadow, playing with the GPS and spending more time in the meadow than we have ever done before. We wandered through the fields of grass and corn lilies and along the willow-choked stream. In the forest at the north end of the meadow Barbara found four morels, with calypso orchids among the morels. Years ago we had camped somewhere in that vicinity on the second night of an ill-fated trip, when low fog shrouded the mountains and incessant rain quenched our spirits. 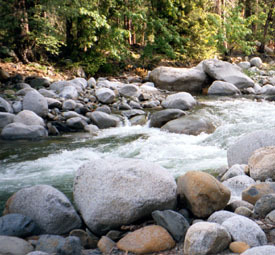 We hiked another quarter-mile up the trail into the forest and found two fine campsites along the river. The day was warm and beautiful, with no bugs. Back at camp we watched from our hammocks the changing patterns of sunlight on the spires of the Sawtooth Ridge and the impenetrable snows choking Bear Gulch on the eastern flank of towering Sawtooth Mountain. Wednesday, June 5, was another beautiful, sunny day on the meadow. We broke camp, packed up, and hiked down to the Alpine Lake trail junction for a relaxing picnic by the river. After lunch we resumed hiking, determined to find the Oak Flat that had eluded us on the way in. Passing through a stand of thin, stunted trees, we discovered a weathered old sign on a scrawny tree beside the trail reading "Oak Flat," but no obvious path down the steep forested slope to the river a quarter of a mile below. Lots of big trees had fallen in that area. Search as we might, we could find no access trail. A little further along the trail we came again to the house-sized granite boulder and the campsite we had foresworn on the way in. It turned out to be a splendid spot to camp. 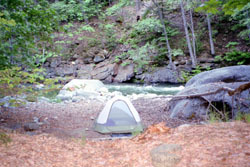 We set up the tent on the sandy shore above the roaring river between the grove of spreading maples and another house-sized rock worn smooth by time and the river. In an old stone pit beneath a stand of Douglas firs we built our fire. That evening was peaceful. When the wind shifted down-river, carrying the chill from the snowfields above, we retired to our tent. The next morning, Thursday, we were up at first light, and found a lone deer in the campsite heading for the river. We watched in surprise as he waded and swam across the class 3 rapids, then jumped up onto the far bank, shook off, and disappear into the forest. On the trail by 9:30, we reached the van by noon and relaxed in the luxury of our lawn chairs. The day was warm and clear. My Achilles tendon and Barbara's right foot were still problematic, and we were beginning to suspect that we needed to go shopping. So we drove to the Fifth Season in Mt. Shasta and bought new boots. Asolos. At the Mountain Supply shop in Ashland I replaced my deer-eaten hat and we bought mapping software to work with the GPS.